This stir fried noodle dish is very similar to the well known pancit canton or pancit miki and the only difference is the noodles used in cooking this dish. Although it is called “pancit bato” which if you will translate it literally it will be “stone or rock noodles” but it is not the case. Before I knew this kind of pancit, I already heard about this from other people and read it online. I was thinking it was a unique kind of noodles used in this dish and in my mind I thought the noodles are hard as a rock. And with some research I found out that the reason why it is called pancit bato is the place where it originate. It’s a town in Bato, Camarines Sur. The noodles are not so much different from the other noodles, it is also made from flour. It is processed by drying it under the sun which is the traditional way but it is also dried using an oven to speed up the process. 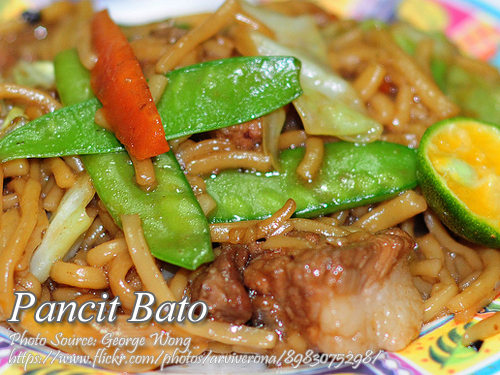 Cooking this pancit bato is as easy as cooking pancit bihon or pancit canton with almost the same steps and procedures. Boil the pork, drain and cut into strips. Bring the pork broth to a boil and add in the shrimp shells and head. Remove the shells and head from the broth and reserve the liquid for late use. In a large wok, heat oil and saute onion and garlic until aromatic. Add in pork and shrimp and saute for 3 minutes. Pour the soy sauce, patis and black pepper and saute for another 3 minutes. Pour 8 cups of pork and shrimp broth. Bring to a boil and simmer for another 5 minutes. Add in the noodles and cover. Simmer for about 5 to 8 minutes or until the dried noodles have absorbed most of the broth. You can add more water if it too dry. Next is add in the vegetables and cook for another 3 minutes or until the vegetables are cooked. Stir until all the ingredients are well mixed. Season with liquid seasoning according to our desired amount and taste. Transfer to a serving dish and serve with calamansi and patis as condiment.